Enough water supplies until early 2020, says RID, as it readies measures to tackle problems. An exodus of nearly 300,000 migrant workers is expected from April 5-30 when they visit hometowns for the Songkran festival in Cambodia, Laos and Myanmar. Temperatures in Thailand this summer is forecast to be 1-2 degrees Celsius warmer than last year. Whatever you want to call it, it can now be grown legally in Thailand and used in medical and scientific applications with the consent of the authorities, under strict guidelines. A battle of political songs – between pro-democracy activists on one side and the police on the other – took place in front of army headquarters this morning in what is a new twist in the aftermath of Army Commander-in-Chief Apirat Kongsompong’s resurrection of the outdated ultra-nationalist song, “Nak Paendin” (Burden of the Land). Police said on Wednesday said they were seeking the prosecution of the leader of the new political party Future Forward over a speech he made that was posted on Facebook last June criticising the ruling junta, the National Council for Peace and Order. THE NATIONAL Legislative Assembly (NLA) has temporarily backtracked from its plan to urgently push through the controversial Rice Bill yesterday. The central bank kept its policy rate on hold this month and expects any future policy tightening to be gradual and dependent on data, according to meeting minutes released on Wednesday. Koh Lan officials will return 95 million baht to Pattaya City Council after they failed to remove 50,000 tonnes of trash from the island, leaving its inhabitants struggling with the stench and the risk of a “trash slide”. State-owned Airports of Thailand Plc approved guidelines on Wednesday for concessions for duty-free and commercial activities at its airports, as it prepares to open up retail space to new players. AMNESTY International Australia has called for the Australian government to conduct an independent investigation into what it called a monumental mistake that led to the much-publicised arrest and detention of a former Bahrain national footballer in Thailand. Krungthai Bank (KTB) has forecast the Thai economy will grow 4.1 percent this year due to the global economic slowdown. State-owned Airports of Thailand Pcl (AOT) approved guidelines on Wednesday (Feb 20) for concessions for duty-free and commercial activities at its airports, as it prepares to open up retail space to new players. According to a recent report, Thailand was noted to be the world’s leader in mobile banking users. The region was second for ownership of cryptocurrency, and third in mobile commerce, according to the Global Digital Report 2019. The pro-Thaksin Thai Raksa Chart party submitted its written defence to the Constitutional Court today against the Election Commission’s ruling that the party committed hostile acts against democracy under the constitutional monarchy by nominating Princess Ubolratana as its prime ministerial candidate. THE POLLUTION crisis will only worsen if the National Legislative Assembly (NLA) pushes through the revised Factory Act, environmentalists warned yesterday. The Criminal Court has sentenced a former beauty contestant to life behind bars for murdering her teenage housemaid and concealing the body near her mother’s house. More than 1,000 people observed a fire-walking ritual in front of the Lim Kor Niew shrine in the southern border province of Yala on Tuesday (Feb 19). With the rapid changes in the media industry, the Bangkok Post Group is transforming its business and operations to better respond to its audience. Registration for advanced voting in the upcoming general election has concluded with over 2 million people registered across the country and over 100,000 Thais abroad. Grass, pot, ganja, marijuana… cannabis. Whatever you want to call it, it can now be grown legally in Thailand and used in medical and scientific applications with the consent of the authorities, under strict guidelines. Nakhon Ratchasima – Authorities have had to declare mud springs in Baan Nong Kung Noi in Nakhon Ratchasima province a disaster area, to bar locals who have persisted in consuming the mud and applying it to their skin believing it has supernatural properties. Prime Minister Prayut Chan-o-cha planted a Bodhi tree from Sri Lanka in Ayutthaya province on occasion of Makha Bucha Day. 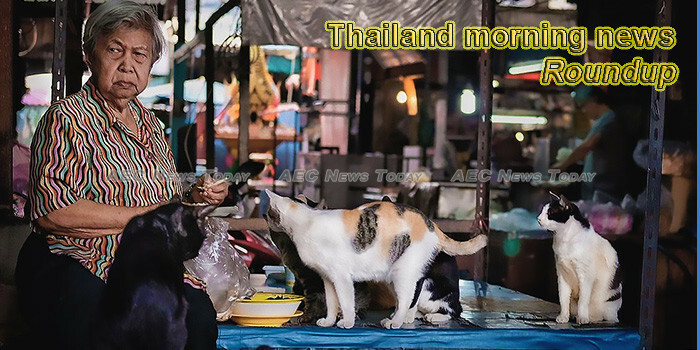 The Thai Bond Market Association (TBMA) is studying a savings scheme for the elderly in preparation for when Thailand becomes an aged society. If you’ve ever powered through the kingdom’s “summer,” you’ll realize that statement is no laughing matter, and sadly, there’s no escaping it. The shock return to power of political veteran Mahathir Mohamad in Kuala Lumpur last May signaled not only a new dawn for Malaysia, but also fresh hope of a peaceful resolution to a decades-old conflict raging across the border in southern Thailand. The Ministry of Labor has cooperated with the Fine Arts Department, the United Nations Educational, Scientific and Cultural Organization (UNESCO) and network agencies to develop the Thai Cultural Heritage Site Conservation Curriculum. F&B chain BreadTalk has bought out its partner in a joint venture in Thailand, acquiring the remaining 50 per cent interest in the company that it does not own from The Minor Food Group (MFG) for 160 million baht (S$6.96 million), it said on Wednesday (Feb 20). Vietnam Net reported that the Trade Remedies Authority of Vietnam, under the Ministry of Industry and Trade, recently reported that it had received information that Thailand’s Department of Foreign Trade begun the final stages of investigation into the matter on January 28. While there is an ongoing debate about whether the hazy Bangkok skyline is just a blip on the radar or Bangkokians need to get used to wearing N95 masks, the future of Bangkok’s property market has also become overcast with significant changes approaching. From full legalization to whole new industries, there are Easter Eggs hidden in the new cannabis law. A tourist has drowned whilst swimming at Hua His Beach near Soi 69. Tragic indeed. But a foreigner Good Samaritan who went in to help the man has had his wallet stolen from the beach whilst trying to save the man. Small groups of pro- and anti-military activists gathered in front of army headquarters on Wednesday, expressing opinions on the army chief’s predilection for an anti-communist song from the mid-1970s.